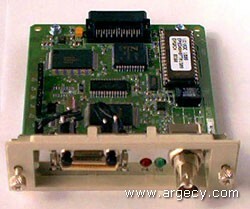 The I-O 9320 Internal Coax Printer Interface Card allows EPSON printers, including the DFX-5000+, with a slot for optional interface cards (C82305/ C82306) to be attached to an IBM 3270 mainframe host. The I-O 9320 offers a wide range of IBM printer emulations, including 3287, 3262, 3268, 4214-1, and 4224, or 3812-1 (non-IPDS). When using an EPSON laser printer with data or word processing applications, Computer Output Reduction (COR) and Automatic Page Orientation (APO) can be used to print reports on letter size paper. The I-O Command Pass-Thru feature allows complete access to all user-programmable printer features. The printer sharing port on the interface is auto-switching offering intelligent Host/PC printer sharing. Support for both LU3 and LU1 modes is also available providing maximum printing flexibility. IBM compatible printing, PLUS additional features provide significant cost savings over traditional coax printing. IBM Compatibility Offers complete IBM compatibility for 3812-1 (non-IPDS) and 5224 printer emulations. Easy Setup Host or PC download configuration "on the fly". PC download or push-button configuration allows setup of the interface without being connected to the 3270 host, for pre-programming of the interface. EPSON Type A Printer Support Supports EPSON FX-870, 1170; DFX-5000+; LQ-570/570+, 870, 1070/1070+,1170; DLQ-2000/3000; EPL-400, 41/42/4300, 5000, 52/5600, 8000, 8100,9000, STYLUS 1000; SQ-870, 1170; Action Printer 5000/5000+, 5500, and Action Laser II, 1000, 15/1600. Intelligent Host/PC Printer Sharing Attach a PC and a Host to the same printer. Automatically monitors both input lines for data and selects the next incoming stream without user intervention. Host/PC Download Commands Allows printer configuration customization. Custom User Strings Allows the user to assign commonly used printer commands to simple identifiers which can be sent to the printer prior to printing a document. PA1 and PA2 Push Buttons Provide optional manual response to Program Attention Requests from the IBM host.